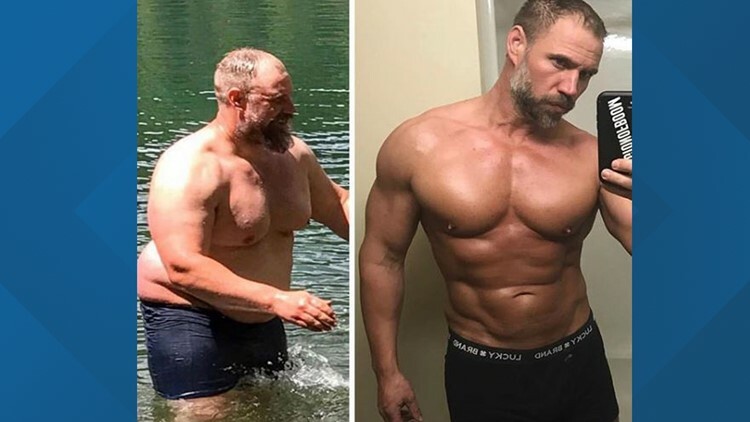 MONTANA, USA — We all have reasons to get in shape or stay in shape, but one Montana man had a simple reason to drop the weight: His family. Jeremiah Peterson, 40, said it all started after he took a hiking trip with his three kids and wife but found himself constantly running out of breath. He would discover that his struggle to keep off the weight wouldn't be nearly as deep as his struggle to keep up with his kids. "Instead of remembering all the good memories we had made on this trip all I can remember is this one thing that kept playing in my head over and over again," Jeremiah wrote in an Instagram post. "I found myself running out of breath and having to take breaks way before my 9, 7 and 6-year-old kids." In five months, he dropped nearly 100 pounds. "100% my strength is to serve my family and to see them succeed in everything they commit to do," Peterson wrote in another post. The hiking story wouldn't be his first or last story, however: He recalls rescuing his wife and kids when one of the kids got a flat tire on a bike. He says he "didn't think anything of it" when he got into his car without a shirt on to go help. "When I showed up to help my wife and kids were mortified that I hadn't put a shirt on and all the parents and kids were going to see my big fat belly!" he wrote in the post. He says he didn't think much about his weight gain until that moment. He started his journey soon afterward. Last year, Men's Health covered Peterson's journey. But, some of his recent Instagram posts have inspired an entirely new audience. Today, Jeremiah says he can run up the same trails that used to wind him with his children without stopping. "If you don't have a strong reason behind your actions you are less likely to get the results," Jeremiah wrote on Instagram.